AddPac GIS MAP based SIP emergency call center total solution consists of SIP emergency call phone, fault tolerant IPNext600 IP-PBX, IP phone solution for call attendant, smart attendant console, IP voice recording solution, smart NMS (network management system). 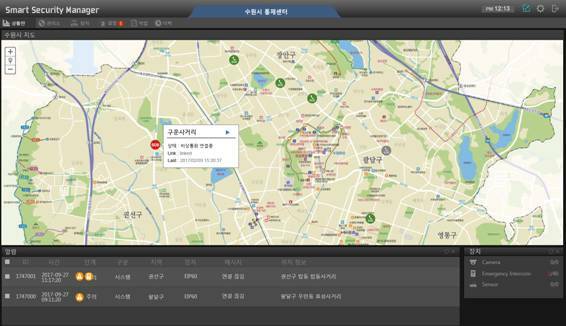 This solution can be used in many different places, for example, tunnel, subway, train, highway requiring emergency call features. AddPac IP based emergency IP phones (AP-EIP100, AP-EIP90, AP-EIP70,,etc) enable the high-quality voice communications by using internet. This phone can be used in many different places requiring emergency call features and supports voice telephony service at optimum level in the general internet environment. 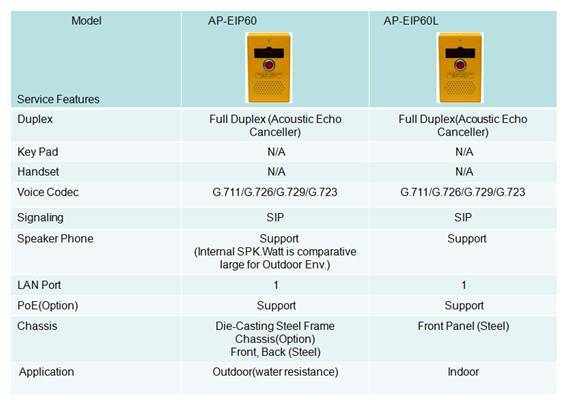 Emergency call button, 3 x 4 dial button, SIP VoIP signaling, various voice codec, speaker interface, off-hook dialing feature and Power over Ethernet (PoE) are hardware, software main features of AddPac IP emergency call phone. IPNext600 fault tolerant IP-PBX delivers a new cost effective IP communication solution for ‘All IP’ environment as a core system of AddPac’s comprehensive IP Telephony solution which features various IP terminals such as AP-IP300 IP phone, AP-IP120 IP phone, etc. Designed on the foundation of high performance embedded RISC CPU, IPNext600 supports the dual system processor boards. Also, IPNext600 supports the dual module type power supply. It’s ideal IP-PBX system for medium size enterprise taking a full advantage of system stability. AddPac IPNext600 NGN(Next Generation Network) IP-PBX provides the Active-Standby system duplication features for fault tolerant architecture. For the system duplication, it use the dual(2) Hot-Swap CPU boards at the front part of chassis. Also, it also comes with two(2) 10/100Mbps fast ethernet port and console port per CPU board. Also the front of IP Next600 also provides LED array which has been designed to grasp system and network utilization at a glance. AddPac Technology IP phones are designed to provide enhanced IP telephony functionality to meet the wide range of business user requirements. This IP telephones optimally deliver rich featured voice telephony service on ordinary internet infrastructure as well as AddPac IP-PBX environment on local LAN as a fully featured IP extension for the complete AddPac VoIP solution. The new and versatile AddPac IP phone bring the integrated solution for the IP based voice communication and the broadcasting feature to maximize business potentials. It provides feature keys, customizable hot-keys, two(2) ethernet ports, the latest QoS, public IP sharing. It supports not only the major VoIP signaling protocols such as SIP, H.323 but also G.711, G.726, G.729, G.723 voice codec, stereo audio in/out interfaces for external Headset MIC, etc. Smart Attendant Console is an IP based soft attendant console that interoperates with AddPac IP-PBX products, which are based on its next generation multi-media IP telephony solution. This product together with AP-IP300 IP phone can be used for IP based soft attendant console solution. In large-scale enterprise, government, etc, for inbound/outbound call processing, call transfer, call exchange, dedicated persons or department are necessary. Smart Attendant Console is IP based soft attendant console solution for them. Smart Attendant Console based on MS-Window program supports all different kinds of services such as messenger service, unified message (voice mail, short message), remote IP broadcasting, alarm registration/processing, beside basic attendant console function like as user presence Board, inbound call rerouting, telephone directory. Smart Attendant Console can be operated by AddPac Technology’s proprietary protocol called Smart Service Control Protocol (SSCP), which is managed between AddPac’s IP PBX and IP terminal like as Video Phone, IP Phone, etc. AddPac IP voice recording solution provides high performance network based digital voice recording/processing function by interworking with AddPac SIP call manager like as IPNext600, IPNext180. For IP voice recording service, SIP emergency call phone at site is connected to call center SIP phone via SIP call manager RTP proxy function. 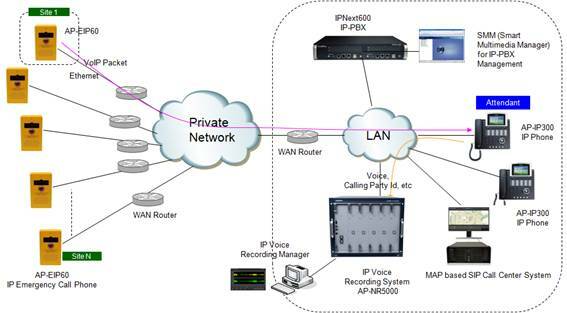 For voice recording service, SIP call manager transmits RTP packet and SIP call detail information (calling/called party number, call duration, etc) to the IP based network voice recording system such as AP-NR1500. Stability/redundancy of system is flexible due to IP based design structure.